The following report was released by the U.S. Air Force on April 4, 2014. Over the last decade, remotely piloted aircraft (RPA) have become a critical component in the application of airpower and one of the most “in demand” platforms the Air Force provides to the joint force. RPA accentuate the core tenets of persistence, flexibility, and versatility of mission. Along with information collection and attack capabilities, they have a proven record as force multipliers during the contingency operations of the last decade. Their utility across the range of military operations (ROMO) remains mostly untested, as RPA, similar to all new acquisitions in the last decade, have not routinely operated in contested airspace or in an A2/AD environment. Current systems have operated in contested threat environments over Baghdad and Libya, though operations were dependent upon the type of platform and network capability. Today, RPA provide near-real-time information, not only to senior operational decision makers but also directly to joint and coalition forces in the field. RPA aid forces in combat currently perform selective precision strike missions against pre-planned or high-value opportunities, minimizing risk of collateral damage. 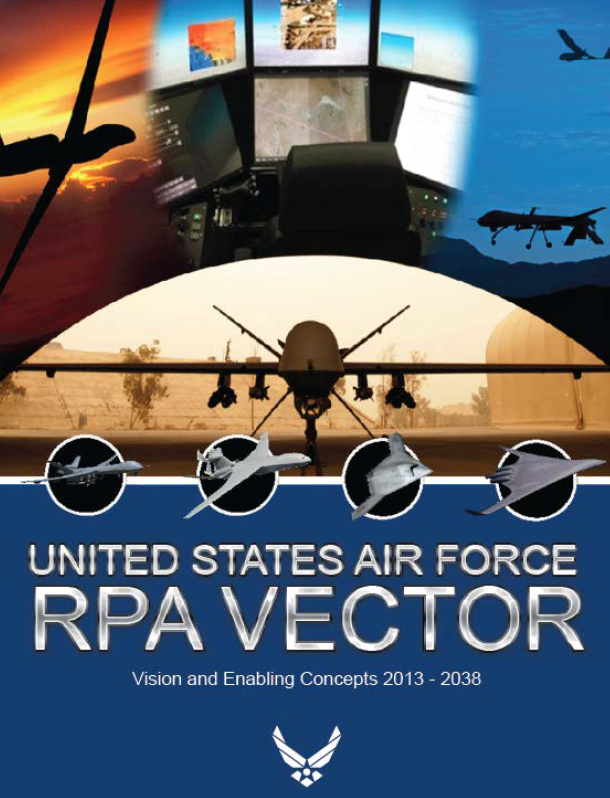 The Air Force has taken preliminary steps toward a comprehensive service-wide review of future RPA applications. In addressing the continued growth of unmanned aircraft systems (UAS), the Air Force will consider a broad doctrinal look at the kind of missions RPA have supported in Operation IRAQI FREEDOM (OIF) and Operation ENDURING FREEDOM (OEF) and will look at the strengths and challenges as well as the current and future demands of the combatant commanders (CCDR) to understand how all components and capabilities can contribute to the successful execution of all phases of conflict. This level of understanding is needed to determine what forces and resources need to be established in baseline budgets from which we would surge in crisis to achieve operational plans strategies, what risk we are willing to accept, or how such risk could be mitigated. Technology advancements must increasingly leverage open architecture, autonomy, modularity, and interoperability to maximize both system effectiveness and service investments. Open architecture and open interfaces need to be leveraged to address problems with proprietary system architectures. Standards and interface specifications need to be established to achieve modularity, commonality, and interchangeability across payloads, control systems, video/audio interfaces, data, and communication links. This openness will enhance competition, lower life-cycle costs, and provide warfighters with enhanced unmanned capabilities that enable commonality and joint interoperability on the battlefield. Focused investments must be made in today’s fiscally constrained environment to further the Air Force’s strategic, operational, and tactical capabilities to support joint operations. These joint forces will possess the capabilities to deploy, operate, and employ autonomous behaviors to reduce pilot and operator workload. The future Air Force RPA force structure will be leaner and more adaptable to maximize the effectiveness of 21st-century airpower. The Air Force will continue to be organized for operations to support strategic missions. • Seamless integration of RPA into operations across all domains (air, space and cyberspace) and levels of warfare (strategic, operational and tactical) will enable future joint forces to leverage cross-domain synergies in environments ranging from permissive to non-permissive. • Widespread use of highly adaptable and flexible autonomous systems and processes to provide significant time efficiencies and operational advantages over adversaries. • Increasingly interoperable systems and platforms through advancements in and application of open architecture, standards, and modularity across joint, interagency and coalition partners that results in a leaner, more effective, adaptable, sustainable and efficient force. • Teaming across departments and agencies, coalition partners, academia, and industry to drive innovation, technology, and efficient use of research and development (R&D) investments. The family of systems (FoS) and capabilities outlined in this document reflect current funded programs, Defense Planning Guidance, Annual Planning and Programming Guidance, and Core Function Master Plan (CFMP) guidance, science and technology (S&T) areas of research and proposed future concepts. The rapid development, growth, and integration of RPA to provide support to ongoing irregular warfare (IW) contingencies; direct support for non–Department of Defense (DoD) government agencies; support to humanitarian/disaster relief operations; and urgent support to other federal and civil efforts have overshadowed efforts to determine the characteristics of future operating environments and the suitability of emerging technologies. • Concept of Operations (CONOPS) and capabilities that directly support the National Defense Strategy will have the highest priority. • Manned and remotely piloted systems will be seamlessly integrated and synchronized in airspace, command and control (C2) architectures, information sharing, and purpose to optimize airpower and increase capability across the full ROMO for the combined force. • Manned and remotely piloted systems will require cross-domain information exchange to provide the freedom of action required by the mission. • Capabilities must be focused to enable unconstrained operational access when a common air, space, or cyberspace domain is unusable or inaccessible. • Secure, efficient, robust, agile and redundant C2 and information distribution will be essential for mission success in all environments. • Increased use of autonomy and autonomous behaviors will increase capability in permissive and non-permissive environments while leveraging operating cost savings. • Open architecture and standardized interfaces will enable modularity, resulting in increased warfighter effect, adaptability, sustainability, interoperability and reduced life-cycle cost. • Impacts of budget sequestration can be mitigated. Mid-term NAS access can include new FAA rules regarding Class A airspace that permit RPA to operate with other aircraft. New rules may also be augmented with GBSAA technologies for access into other classes of airspace. GBSAA is a ground-based means of detecting airborne traffic and providing the necessary SA to the SUAS-O or RPA pilot. A GBSAA system includes sensors, correlation, fusion, communications, networks, logic, procedures, and user interfaces. GBSAA is a technological solution using ground sensors to detect aircraft and alert the RPA pilot or SUAS-O with suitable lead time to allow appropriate avoidance maneuvering, enabling safe and robust mission operations without risk of airborne collisions. The first DoD GBSAA for RPA went operational at the Army’s El Mirage, California, facility on 26 April 2011. This system at El Mirage, California, had limited operational application and has since been suspended and moved to Dugway Proving Grounds due to continuing regulatory differences. The Air Force must continue to build on the initial framework to increase access through a more robust detection and alerting system. Mid-term GBSAA efforts are focused on developing methods to provide aircraft separation within a prescribed volume of airspace using a ground-based system that includes sensors, displays, communications, controls, and software. The complete system will include HMI displays, controls, and software algorithms necessary to provide recommended or perhaps automated maneuvers. GBSAA solutions will incrementally relieve restrictions on existing COAs and facilitate RPA/SUAS training in the NAS. This effort is establishing requirements, gathering data, performing modeling and simulation, testing and verifying collected data, and obtaining airworthiness approvals, as appropriate. GBSAA can particularly benefit SUAS where SWaP limitations prevent larger more complex ABSAA solutions from being easily incorporated. Such a system should be a low-cost, scalable, deployable system capable of responding to Title 10 and Title 32 National Guard requirements for DSCA. Current UAS are built to different specifications for different purposes; therefore, showing individually that each system is safe for flight in the NAS can be complicated, time consuming and costly. Routine access will happen when DoD establishes and certifies an acceptable level of safety for UAS and manufacturing standards meet that threshold. Once developed, standards for UAS acquisition will improve system interoperability and yield cost savings. One key long-term objective is the fielding of a certified ABSAA solution. Airspace access will be similar to manned aircraft; though certification requirements have not been established, the current level of technology and automation demonstrated may be sufficient. ABSAA development efforts are focusing on onboard capability to perform both self-separation and collision avoidance to ensure an appropriate level of safety. Current programs have phased validation schedules for due regard, en-route/Class A, and divert/Class E/G operations as technology innovation and integration allow. The ABSAA system must provide autonomous maneuvering to maintain self-separation/collision avoidance in the event of lost link and provide for pilot-in-the-loop capability as operations dictate. 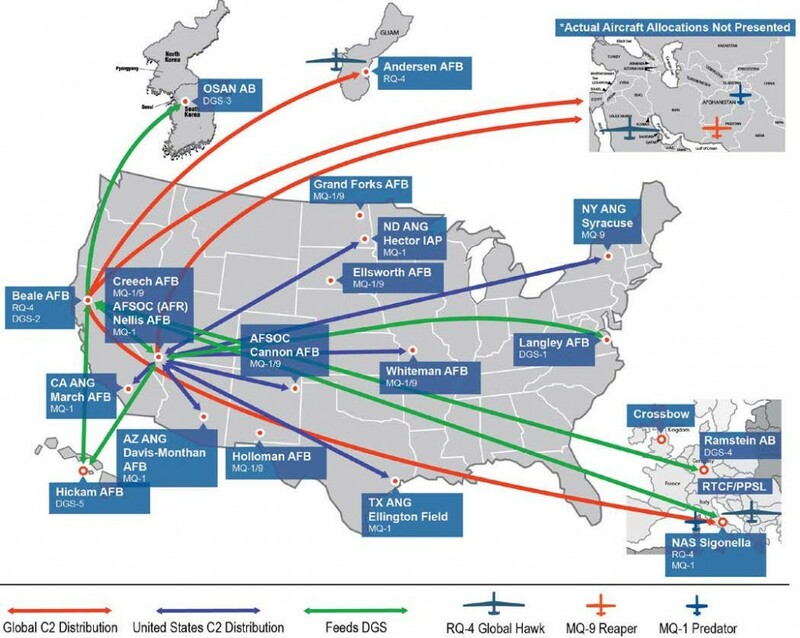 The Air Force and Navy should leverage a common functional baseline for the RQ-4 Global Hawk and MQ-4 Broad Area Maritime Surveillance (BAMS) aircraft as initial demonstration platforms for ABSAA. The capability should be extended to other RPA and SUAS where it provides strategic benefit and can be seamlessly integrated with GBSAA technology as part of a SoS solution. Autonomy will mitigate loss of data links and will ensure avoidance maneuvers are executed in time to avoid breaching defined collision thresholds. The system will be designed to be modular, open architecture, non-proprietary (Government data rights), and multiaircraft capable, providing commonality and interoperability across RPA. These technologies will further be scalable to SUAS. The heart of the Common-ABSAA capability will be a sensor/platform-agnostic data integration/fusion engine and its accompanying collision avoidance algorithm. The Common-ABSAA will use sensor and aircraft personality modules to control the interfaces for multiple aircraft sensor and MDS configurations. Onboard non-cooperative sensors such as radar, EO/IR, LIDAR, and acoustic, as well as cooperative sensors such as Traffic Collision Avoidance System (TCAS) and ADS-B, can be mixed and matched to meet current and emerging requirements in all classes of airspace. ABSAA will pursue commonality with GBSAA solutions to minimize duplication; leverage lessons learned; maximize common training, maintenance and documentation; and provide a seamless ABSAA and GBSAA HMI for the pilot/operator. Greater ABSAA/GBSAA commonality will reduce life cycle costs, build efficiencies, and promote ease of future upgrades. The objective of an autonomous terminal area and ground operations (ATAO) effort is to develop a control architecture that enables RPA to operate in the terminal area with specific emphasis on ground operations. An ATAO-compliant RPA will receive, read back, and perform all commands from ATC in a timely manner. In the case of unclear instructions or if the RPA determines ATC has given an incorrect command, the RPA will obtain clarification. After receiving commands from ATC, the RPA will complete the assigned task in a human-like fashion, using pre-programmed autonomous behaviors. Similar to human operators, the RPA will combine observed information with holistic modeling of typical airfield operations to predict the actions of other aircraft. The RPA can stop and query the controller if it detects an unsafe situation developing. Gorgon Stare provides day/night continuous broad-area motion imagery to find and fix targets within the field of view. The capability combines real-time SA for SCAR or cross-cueing other sensors, with persistent video recording for forensic analysis and pattern-of-life study. Algorithms that would detect moving targets will be integrated via standalone systems at the appropriate ground ingest point. The dismount detection radar (DDR) fills a gap in radar collection/tracking of dismounted personnel. The DDR system will have the ability to simultaneously transmit and disseminate DDR sensor data to real-time users, intelligence exploitation nodes, and DoD data repositories. The DDR system will support Level 3 control, allowing control and monitoring of the UA payload by a designated tasking authority, and will augment MQ-9 Block 5 Reaper’s hunter/killer mission. MQ-9s equipped with DDR will provide persistent detection and tracking of vehicles and dismounts in day/night, all-weather conditions and will be integrated into DCGS. The system will be BLOS and LOS capable and will provide commanders and intelligence analysts with reconnaissance to support SA, target identification, time sensitive targets, target engagement, BDA, dismount patterns of life, and intelligence preparation of the battlespace. In a Title 32 domestic response, this system will provide an incident awareness and assessment role for authorities during natural disasters. There are also potential applications for border security operations. DDR capability is planned for operations by the end of FY14. The Airborne Cueing and Exploitation System Hyperspectral (ACES HY) is an advanced infrared sensor that provides the capability to find hard-to-detect targets in a wide search area by collecting and processing target data from the visible (.4 mm) to shortwave (2.5 mm) spectrum. The first production sensors were delivered in March of FY12. ACES HY sensor and processor design will be integrated into the configuration baseline and PED upgrades planned to enable data exploitation. Modifications to Block 15, 30, and 50 MQ-9s GCS will incorporate high definition (HD). The full-scale HD Digital Video Architecture will be incorporated into Block 5 MQ-9s. AFSOC modified four aircraft and three GCSs to perform HD operations in December 2011 per JROCM 066-10. In April 2012, AFSOC modified three additional aircraft and one GCS to support HD operations. The first phase implements target location accuracy (TLA), which will support enhanced data exploitation tools, including real-time display of target coordinates, digital data archiving, digital video recorder playback capability, and image mosaicking. 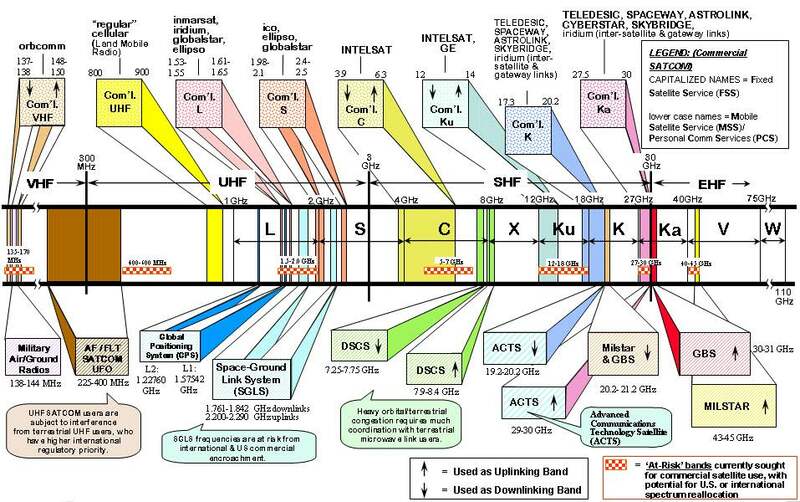 The first phase also integrates the Raytheon Community Sensor Model (CSM), which separates “key length value” metadata for LOS/BLOS links, integrates CSM in the GCS, and provides “near-frame synchronous” metadata. The final fielded TLA (-3) MTS-B turret will enable “frame synchronous” metadata and 720p HD IR.